Once again I am missing Tucson. Why, you may ask, do I care about Tucson and what brings me to state this in my daily blog? Well, right now Tucson is the heart of the gem and bead-buying nation with the Tucson Gem Show going on now and most of the bead shows scheduled for this coming weekend. 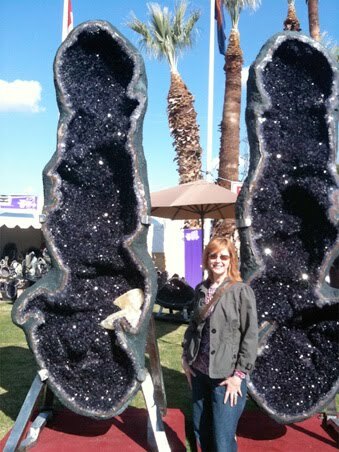 Fortunately I still have gemstone material from my last major trip that I can work with in my own work, but it was always a nice break from winter, to head down to the (relative) warmth of Arizona, look at amazing rock, gems and beads, and catch up with friends. My DH and I have wanted to go together to the show for many years. When we retire, I'll try to get us down there just so that he can have the experience of it. It is a unique, fun, and overwhelming experience that I always enjoy, no matter how much or how little money I have available to spend. Aren't these crystals amazing? Just a small part of the Tucson Gem Show that people will be seeing this week. They are excellent. I started with The Sunne in Splendor and then went to Lionheart, both at Oshun's recommendation, and they are marvelous. I have to say, you had me laughing this morning while I was reading your OEAM. Love what I've read of it so far. I have too many post-it tabs for possible illustrations - time to cull - LOL. I am glad I made you laugh - I had no idea whether you would like it or not.